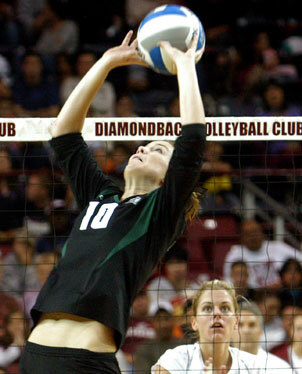 Hawaii setter Stephanie Brandt finished with 43 assists in the Rainbow Wahine's victory. LAS CRUCES, N.M. » It had gone five games four of their previous seven meetings. With so much riding on the outcome last night, should No. 8 be any different? The most anticipated title showdown in the Western Athletic Conference tournament perhaps since 1998-- when Hawaii and BYU played for an NCAA record 3 hours and 31 minutes -- did not disappoint fans of volleyball. And definitely not the pocket of Rainbow Wahine backers, who saw No. 11 Hawaii pull out a 28-30, 30-20, 24-30, 30-23, 15-11 victory over No. 13 New Mexico State. Jamie Houston repeated as the tournament MVP, putting down a match-high 22 kills, in leading the Wahine (24-5) to their eighth WAC tournament title in 10 appearances. It took Hawaii 2 hours and 53 minutes to turn back the host Aggies (26-5), beating New Mexico State for the third time this season. For the first time this year, the Wahine had all five attackers with double-digit kills, and four players with double-doubles. Also named to the all-tournament team from the Wahine were Aneli Cubi-Otineru (17 kills, 20 digs, three aces) and Stephanie Brandt (43 assists, 17 digs). LAS CRUCES, N.M. » With a defense that matched determination, Hawaii dug deep -- and often -- in earning its eighth conference tournament title last night. The Rainbow Wahine return home to Honolulu today, not only with the Western Athletic Conference tournament title but also the automatic NCAA berth that goes with it. There's additional hardware as well: Jamie Houston's second MVP plaque and all-tournament awards for sophomore hitter Aneli Cubi-Otineru and sophomore setter Stephanie Brandt. It took 2 hours and 53 minutes before No. 11 Hawaii dispatched No. 13 New Mexico State, 28-30, 30-20, 24-30, 30-23, 15-11, the first WAC title match that has gone five since the 1998 epic won by the Wahine over BYU. A Pan American Center crowd saw Hawaii put on a defensive clinic, with 90 digs that deflated the normally potent Aggie offense. "Their floor defense really put a hurt on us," NMSU coach Mike Jordan said after his team lost to Hawaii for the third time this season. "They just dug some bombs, managed to make digs on balls that mostly go down for kills. "We've only been in three (WAC tournaments), and this by far was the best one." It was also by far Hawaii's best overall team effort of the season. All five starting attackers had double-figure kills, led by Houston's 22. Five players had double-figure digs, with Tara Hittle one off her career-high with 21 and Cubi-Otineru finishing with 20. "I think our defense was outstanding," Hawaii coach Dave Shoji said. "It was a match we all expected to go five. It's been a battle every time we've played them, especially here. "We need to be better-balanced if we're going to beat good teams. I thought everyone got involved in the offense." Hawaii's Tara Hittle and Stephanie Brandt cheered after scoring against New Mexico State in five games last night. Four players had double-doubles: Houston (22 kills, 10 digs); Cubi-Otineru (17 kills, 20 digs); Hittle (13 kills, 21 digs); and Brandt (43 assists, 17 digs). Juliana Sanders added 12 kills and was in on five blocks and Amber Kaufman had 10 kills. Kim Oguh led the Aggies (26-5) with 14 kills, while Lindsey Yon and Amber Simpson each had 11. Libero Krystal Torres finished with a match-high 21 digs. After giving away Game 1 -- when squandering a 28-25 lead -- and then splitting Games 2 and 3, the Wahine found a way to turn the momentum in Game 4. Brandt's 5-0 serving run helped Hawaii go ahead at 16-12 and NMSU played catch-up the rest of the way. At 25-22, Brandt had a 3-0 service run and the Wahine evened the match when closing it out on a 5-1 run. After the Aggies went up 4-2 in Game 5, Hawaii took the lead for good when scoring four unanswered points. The only thing that slowed the Wahine down was an injury to Aggie sophomore hitter Krista Altermatt, who landed on the foot of Hawaii reserve setter Dani Mafua at 12-8. It took about 7 minutes before Altermatt was wheeled off the court on a gurney and about the same amount of time for the Wahine to finish it off. "The thought passed through my mind that it (Altermatt's injury) might be great incentive for their team," Shoji said. "But I was more concerned for her and it kind of took the joy out it by her getting hurt." The diagnosis was a severely sprained right ankle, something that wasn't expected to keep Altermatt out of the postseason. Hawaii closes out the regular season when hosting Loyola Marymount on Tuesday and Wednesday. The Lions (16-11) won their third in a row yesterday when downing St. Mary's in four. Aces --NMSU(6): Rodgers 2, Bostic 2, Oguh, Altermatt. Hawaii (5): Cubi-Otineru 3, Brandt, Kaaihue. Assists -- NMSU (55): Rodgers 25, Gintant 23, Torres 3, Yon 2, Callis, Altermatt. Hawaii (67): Brandt 43, Mafua 11, Kaaihue 5, Cubi-Otineru 3, Houston 2, Kaufman, Hittle, Lee. T -- 2:53. Officials -- Eric Asami, Ken Katabi. A -- 4,046.